In today's first T3 Agenda of the week - Flexson teams up with Sonos to produce a new series of speaker stands. Logitech unveils its latest keyboard, the Craft. And more! 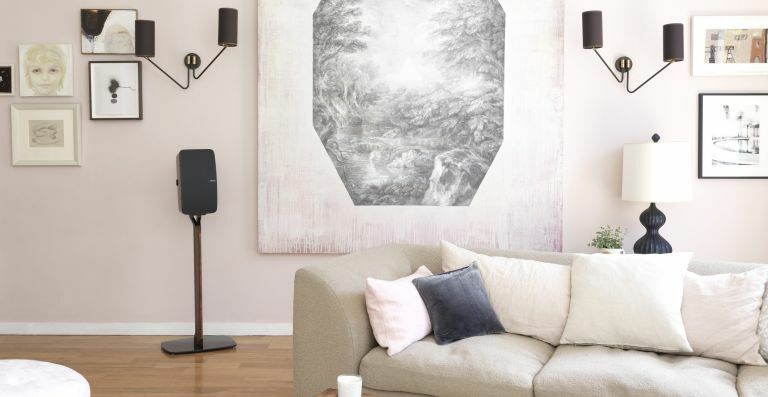 Speaker accessory firm Flexson has launched a brand new stand for Sonos' Play:5 home speaker that keeps the device at optimal listening height, as well as tidying away power cables and offering a high-quality furniture feel. The Flexson Premium Floor Stand for Sonos Play:5 - which is made from hardwood, metal and glass, with a choice of finishes (white/oak and black/walnut) - can securely hold the speaker in either horizontal or vertical position. It features a stable base that can slip under sofas or chairs if needed, plus cable channeling to neatly hide away the speaker power cable. The Flexson Premium Floor Stand for SONOS PLAY:5 is available now from Amazon and direct from Flexson.com, with a price tag of £199.99. In need of a new smart keyboard? Sounds like you need Logitech's new Craft Advanced Keyboard. It features a touch-sensitive aluminum creative input dial, called the Crown, which enables you to touch, tap or turn to adjust image brightness, contrast and saturation in Adobe Photoshop, or create and adjust charts in Microsoft Excel. It also features smart illumination with backlighting that detects your hands and adjusts lighting automatically depending on the room conditions. Then there's Easy-Switch - which enables you to switch between – and type on – any three connected devices. The Logitech Craft Advanced Keyboard arrives mid-September 2017 at Logitech.com with a price of £179. UB+ has debuted a brand new speaker, one that uses a retro-style spherical design that's not only cool to look at, but creates a broad and robust audio experience - the EUPHO E360. The sphere is known to be the most ideal shape for the design of a speaker enclosure, due to the least amount of ripples in the frequency response. With the UB+ EUPHO E360 Speaker, the spherical form, together with the use of a single 6.5” full range driver and a 50W digital amplifier, provides the most optimal factors for sound radiation. The UB+ EUPHO E360 Speaker will be out later this year. Outdoor clothing maker Iffley Road has teamed up with shoemaker Vivobarefoot to launch a new limited edition capsule collection, which this time includes barefoot running shoes - Iffley Road x Vivobarefoot. The new wave includes Iffley Road’s classic t-shirt reimagined in the shade Night Sky and Track White with the distinctive chevron design and the Vivobarefoot iconic, best-selling Primus Trail FG and Primus Lite now also feature Iffley Road’s signature colours and logo. The new limited edition Iffley Road x Vivobarefoot collection launches on 18 September, with prices starting from £68. The Zepp Tennis sensor is back with a new generation, and its just what you need if you're looking to improve your backhand or slice. The Zepp sensor easily attaches to any tennis racquet and tracks stroke type, spin, ball speed, ball spin and sweet spot accuracy. The data is sent wirelessly to iOS or Android devices via Bluetooth, where you can then use a special tournament leaderboard to rank yourself with other users and challenge opponents within the Zepp tennis community. The new device also uses Smart Capture technology, enabling you to easily record video of each rally and then generate, and share, your match highlight reel. Zepp Tennis 2 is now available for $99.99 (£76) at Zepp.com and leading retailers.